I am now going to commit the time-honored faux pas of explaining today’s comic. “Lymon Orcs” is the term I’ve never used in the comic for the baddies from Sprite Comic Week. These two have appeared before in comics #145, #195, and #257. Not much happened in any of these. 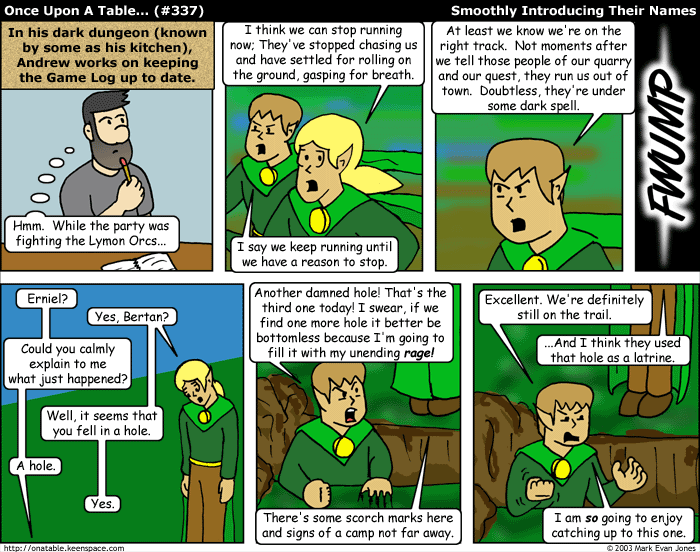 Today’s strip depicts these two catching up to the party’s position during strip #130. And now that I’ve sucked all the mystery out of today’s comic, I’m going to go have a cookie. Subscribe to receive notices when Once Upon A Table deigns to update for real.